The choice of bats shown above does not reflect any preference for brand names. These just happen to be two bats that I currently have in my laboratory. Composite material baseball and softball bats have been around for quite a while, but only in the last few years have they begun to seriously compete with aluminum bats. As far back as 1985, graphite and plastic bats were available[1,2] and by the late 1980's each of the three big bat companies - Easton, Worth, and Louisville Slugger - had graphite bats on the market. These early bats were advertised as "having the strength of aluminum and the performance of wood." They were very strong and held up to a lot of abuse, but because they did not perform nearly as well as the more popular aluminum single-walled bats then available they did not remain on the market very long. For about 10 years graphite bats pretty much dissappeared from the scene, but by the late 1990's a few small bat companies - most noticeably Miken - were reintroducing carbon fiber, or composite material, bats into the market again. Like their predecessors, these composite bats were pretty durable, but not very high performing. But soon after 2000 things began to change. In 2001 the Louisville Slugger Genesis all-composite slow-pitch softball bat achieved the #1 ranking in Performance at the 2001 Bat Wars, and just barely lost the overall #1 ranking to Worth's EST double-wall aluminum. Composite softball bats were now competing with the best available aluminum bats. There were problems with durability, however - the early Genesis bats (model SB34) were notorious for breaking after 50 or so good hits. The second generation Genesis (model SB103) has a slightly thicker wall and is more durable, though at a slight sacrifice in performance. But, the point had been made: it was possible to design and manufacturer a composite bat that could perform as well as the best aluminum bats available. Then in May of 2002 Miken introduced their gray Velocit-E "Ultra" - which is to date the highest performing softball bat commercially available (believe it or not I have seen some prototypes which outperform the Ultra!). The Miken Ultra was so hot that organizations like the Amateur Softball Association quickly banned it, and threatened to ban all composite bats - as they had banned all titanium bats back in 1993. Instead, after much consultation with manufacturers and with advice from a couple of scientists and engineers who really understand the bat-ball collision, the ASA decided to change and toughen up the performance standards used to certify bats as being legal. Today there is a wide variety of composite choices from several manufacturers, including all-composite bats, bats with composite handles and aluminum barrels, bats with composite outer shells over aluminum barrels, and even some all-composite double-wall bats. The majority of composite bats are slow-pitch bat models and in the slow-pitch game composites definitely reign surpreme. There are a few all-composite baseball bat models available, but aluminum baseball bats still appear to be preferred by youth and college players. So, this brings us to the question at the top of this page. How are composite bats different from aluminum bats? And, how is it that composite bats are able to outperform the best aluminum bats? The figure below right shows performance data for a wide variety of bats that was collected around the year 2000 when the Amateur Softball Association was validating the new high-speed test method for assessing the performance of slow-pitch softball bats. In this test method, a bat is gripped 6-inches from the knob end of the handle by a clamp which is free to rotate about a fixed pivot point. A softball is fired from a compressed air cannon at a speed of 110mph towards the bat barrel. The speed of the ball is measured, using light traps, before and after it impacts the bat. An equation based on the conservation of momentum, and which takes into account the impact location and the moment-of-inertia of the bat is used to predict the batted-ball speed which a good player would achieve in the field with the bat in question. The ASA had assembled a collection of bats of various types (wood, old and new single-wall aluminum, double-wall aluminum, titanium, and composite) and measured their performance in the process of developing the high speed performance test. In 2004 I was granted access to the bats so that I could attempt to correlate the frequency of the barrel hoop mode to batted-ball speed. 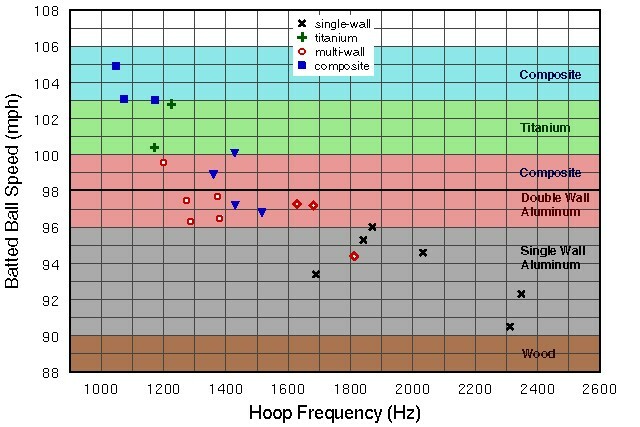 The hoop frequency of a bat appears to be closely related to the physics behind the trampoline effect in a hollow bat. My experimental studies and computational models of the physics behind the trampline effect indicate that the lower the frequency of the hoop mode, the more compliant the bat barrel, which in turn gives rise to an improved trampoline effect and a higher batted-ball speed. The data in the figure shows that this prediction is validated by experimental results. Higher performing bats (greater Batted-Ball Speed) tend to have lower hoop frequencies. The data points in the figure below have been identified by color and shape according to the type of barrel construction, and this provides an interesting analysis of the performance results. Using the high speed impact test, wood bats produce batted-ball speeds between 88-90mph (there are no data points for wood bats because a solid wood bat does not have a hoop frequency). Single-walled aluminum slow-pitch softball bats produce batted-ball speeds between 90-96mph. The best double-walled aluminum slow-pitch softball bats on the market have batted-ball speeds between 96-100mph. In 1993 Easton, Worth and Louisville Slugger each introduced titanium softball bats (Worth had kept theirs under wraps for several years because they knew it would radically change the game and only released it when Easton did). At the time titanium bats were introduced, the best single-wall aluminum bats were performing around 93-94mph, so when the titanium bats with batted-ball speeds between 100-103mph entered the game they made an immediate impact. In fact, titanium bats were so much hotter than anything else available that they were quickly banned by all governing organizations within three months of their introduction. Composite bats actually cover the entire range of performance. The early ones (which were not tested in this study) performed like an average single-walled aluminum bat. There is a group of recent composite models which compete in performance with the best double-walled aluminum slow-pitch softball bats, having batted-ball speeds between 96-100mph. And then there is a select group of super high performance composite slow-pitch softball bats, including the famous Miken Ultra, which are capable of producing batted ball speeds in excess of 105mph. The horizontal line at 98mph represents the current upper limit in performance as set by the ASA for slow-pitch softball bats using the ASTM F2219 high speed test standard. As as result, high performance composite bats like the Miken Ultra and Ultra II, and the Easton Synergy, titanium bats, along with several other composite and double-walled bats are now illegal for ASA league play. What Advantages do Composite Bats have over Aluminum Bats? From a simple physics analysis of the bat-ball collision, there are two ways to increase performance. The first is to adjust the swing weight of the bat. Actually this is slightly complicated because there are two factors which somewhat offset each other. If a player is able to bulk up his/her muscles and swing the same bat faster, the resulting batted-ball speed will be faster due to the higher bat-swing speed. On the other hand, if a player is able to maintain a constant swing speed while using both a light and heavy bat the batted-ball speed will be fastest for the heavier bat. The best results are obtained by swinging a heavier bat faster, but this is something that most average players are not able to do and still maintain control over the bat while swinging it. So, usually a player will choose one or the other effect. Good players who are stong tend to prefer bats with a heavy swing weight because they can swing the bat fast enough and the extra inertia of the bat makes for a more effective collision with the ball. Players who are not as strong, or who cannot swing a heavy bat quickly, tend to opt for bats with a lighter swing weight so that they can increase their bat-swing speed and obtain faster batted balls that way. The distinction between light or heavy swing weight really boils down to the location of the balance point (or center-of-mass) and the moment-of-inertia. I plan to discuss this in much greater detail on my MOI and bat-swing speed page, so I won't go much depth as to how this works here. But, the basic concept is that it is not the total overall weight of the bat which determines how fast you can swing a bat, but the way that weight is distributed along the length of the bat. The closer the bat's balance point is to the handle, the easier it is to swing. I have two bats in my lab which I routinely bring into my physics classroom to illustrate this point to my students. One bat is aluminum and the other is composite, but bats are 34-inches long and both weight exactly 30-oz. However, picking them up and swinging them clearly differentiates between the two. The aluminum bat has a balance point 22.5-inches from the end of the handle and has a very large moment-of-inertia (11,134 oz-in2). The balance point for the composite bat is more than 3 inches closer to the handle, at 19.4-in, and as a result it has a much lower MOI (8963 oz-in2). Even though both bats have the same actual weight, the difference in their balance points and MOI causes their swing weights to be very different. The graphite and glass fiber materials used to manufacture composite bats are much lighter than aluminum. In fact, most composite bats have metal rods inserted in the handles in order to bring the weight up to normal values. The lightest bats currently available are composites. As such, it is much easier to shift mass around from barrel end to handle (or the other way around for end-loaded bats) to control the location of the balance point and thus the swing weight. In fact, a few years ago when the BPF test was being used by all softball governing organizations (a similar test called the BESR was being used by NCAA baseball) to measure bat performance (all tests were conducted by impacting the bat at its center-of-percussion) it was discovered that by shifting the balance point, a manufacturer could design a bat that would pass the required performance test, while it performed much higher in the field. The second way to increase the performance of a bat is to enhance what is known as the trampoline effect of the barrel. The barrel of the bat essentially acts as a spring during the bat-ball collision. If the barrel spring is very stiff, then the ball compresses a great deal upon impact and loses a significant amount of energy in the process of compression and re-expanding. However, if the barrel of the bat is made softer, then the barrel compresses more, the ball compresses less, and the ball loses less energy during the collision. Furthermore, the energy which was temporarily stored in the barrel spring is returned to the ball and the ball speed is greatly increased after the collision. In an aluminum single-wall bat, pretty much all you can do to increase the trampoline effect is to make the walls thinner - and a point is quickly reached where the walls are too thin for the bat to endure an impact from a ball without denting or cracking. In addition, thinning the walls in an aluminum bat changes the mass distribution of the bat. Composite materials have a distinct advantage over aluminum in that they are anisotropic, which means that the elastic properties of a composite material are not the same in all directions. By changing the angle of the weave in the composite material fabric, the stiffnesses in the longitudinal (along the length of the bat) and circumferential (around the barrel of the bat) directions can be modified pretty much independently of each other, and without changing the distribution of mass along the length of the bat. This means that you can make the barrel of a composite bat soft while still maintaining the stiffness in the handle. Or you could make the handle softer while keeping the barrel stiff. Composite materials provide a manufacturer with a very wide range of possibilities to design a bat to a targeted performance and/or feel. There are composite bats which perform about the same as a lesser quality single-wall aluminum bat. There are composite bats which match the performance of the best double-wall aluminum bats available. And then there are composite bats which outperform any metal bat ever made (including the legendary titanium bats). By adjusting the stiffness of the barrel a manufacturer is able to "tune" the trampoline effect of a bat to increase or decrease performance pretty much as desired. With aluminum, a manufacturer is constrained in how thin the walls of the barrel and handle can become before the structural integrity of the bat is compromised. One manufacturer told me how they were trying out a new prototype fast-pitch softball bat for one of the US national women's team players. In trying to make the bat light enough with swing weight she desired they ended up thinning the walls of in the handle. The result was a bat that literally bent in half every time she made good contact with the ball. To make the handle strong enough that it won't break, the thickness of the aluminum tubing usually results in a relatively high bending stiffness, though the bending stiffness does also depend on the dimensions of the barrel. Higher bending stiffness means that the frequencies of the bending vibrations for the lowest bending mode fall into the range where the hands are most sensitive to vibration. Hitting a ball away from the "sweet spot" causes the bat vibrate, and that vibration may be felt strongly in the hands as a painful sting. It is no coincidence that aluminum bats have thick rubber padded grips do add damping to the handle, and many players wear thick batting gloves when hitting with an alunimum bat to further reduce the sensation of sting. Composite materials, however, give the manufacturer the option of lowering the bending stiffness of the bat, without changing any of the stiffness properties in the barrel which affect performance. This means that one might be able to design a bat which would "feel" better or sting less by adjusting the bending stiffness. The graph at right shows how the sensation of vibration, in a human hand gripping a vibrating rod, varies with the frequency of vibration. The lower solid curve indicates that the hands are most sensitive to vibrations between 200-300 Hz, and much less so to vibrations below 100 Hz or above 500 Hz (note that a logarithmic scale is used for both axes). The blue data points and dashed lines indicate the relative sensation for a current production composite slow-pitch softball bat with a very stiff handle and a fundamental bending vibration of 220 Hz. The red data points and dashed lines are for a different softball bat with much lower bending stiffness and a fundamental bending frequency of 85 Hz. 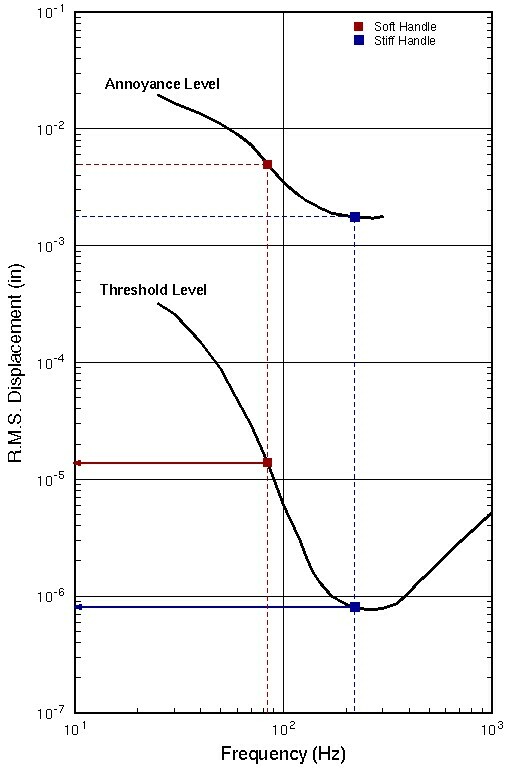 Using the Threshold Level curve, the plot shows that the hands will be more than 10 times more sensitive to vibrations in the handle of the stiffer bat than they would be for the bat with the lower bending stiffness. These two values represent the extremes that currently exits for softball bats. And while most slow-pitch softball bats have fundamental bending frequencies between 150-200 Hz, the use of composite materials provide a manufacturer with a considerable amount of variation in the way a bat will feel in the hands of a player. One of the more recent trends, which DeMarini and Easton have been successfully marketing, is a hybrid bat in which an aluminum barrel is attached to a composite handle with low bending stiffness. Such bats are marketed as having improved "whip action" allowing the bat to flex more during the swing. The idea is similar to what happens in a good golf swing. If the mechanics of the swing are timed just right, the bat flexes during the swing, and the bending of the bat causes the bat barrel to move forward just before contact is made with the ball. Thus, the bat barrel speed is a combination of the rigid rotation of the bat and the flex, and the effective bat speed may be faster than what one could obtain for a stiff bat which does not flex. Of course, if you don't time the swing just right the bat barrel would be moving backwards because of the flex while the bat as a whole is rotating forward, and the effective bat speed would be reduced. As far as I know the jury is still out as to whether this handle flex "whip action" actually improves performance, but I have heard that it does affect a player's swing mechanics in addition to affecting the perception of feel. Another advantage of composite materials over aluminum is that the natural damping rates for composite bats are about twice as high as those of aluminum bats. The damping rate dictates how quickly the amplitude of a vibrating object decays. The higher the damping, the more quickly the vibration will die away and the player holding the bat will not feel it as strongly. A lower damping rate means the vibration will continue for a longer time and the player will feel the vibration more. In our laboratory we have measured the damping rates for the first two bending modes of various softball, youth baseball and adult baseball bats. The damping values for all-composite bats or bats with composite handles are at least twice as high as aluminum bats, and some composite bats have as nearly 10 times more damping than aluminum bats. This is partly why composite bats are advertised as having a "more forgiving sweet spot." Bat hits away from the sweet spot don't hurt as badly, because the painful vibration is more heavily damped in a composite bat. Of course it is possible to add damping reduction systems to an aluminum bat to increase the damping - many youth bats have such vibration reduction systems. But, these tend increase the overall weight of the bat, and are not often used in adult bats. A final difference between composite and aluminum bats is that they sound very different when hit. The sound that the bat makes when it impacts a ball is one of three things that players perceive as being related to performance. [Golf] Whereas a wood bat makes more of a "crack," aluminum bats produce a noticeable "ping" when contact is made with a ball. The ping can be quite loud, and is a relatively pure single frequency sound. Composite bats also produce a single frequency sound, but the much higher damping causes the sound to decay much faster, and the resulting sound is more of a "pop." This can take some adjusting to. I have heard players who are used to hearing a loud ping from their aluminum bat complain after swithing to a composite bat that doesn't perform as well because is doen't have the same "pop" as their aluminum bat has. In reality the ball left the bat as fast or faster, but because the sound isn't what they are used to, the perception is that the performance is not as good. It usually takes several good swings before this incorrect perception of performanc is overcome and the player sees the results of the ball leaving the bat and starts to associate performance with this new sound. ASTM F-2219: Standard Test Methods for Measuring High Speed Bat Performance. The high-speed air cannon test was developed at the WSU Sports Science Laboratory. Their website has photos and movies of the cannon in action. D.A. Russell, "Hoop frequency as a predictor of performance for softball bats," Engineering of Sport 5, Vol. 2, pp. 641-647 (International Sports Engineering Association, 2004). D. A. Russell,"Tuning a bat to optmize the trampoline effect," presented at the Sporting Goods & Manufacturers Association Baseball & Softball Council Fall Meeting, Dallas, TX, October 2-4, 2003. D.D. Reynolds, K.G. Standlee, and E.N. Angevine, "Hand-arm vibration: Part III. Subjective response characteristics of individuals to hand-induced vibration," J. Sound Vib., 51(2), p. 267-282 (1977). See my page on Controlling vibration with a dynamic absorber for one example.